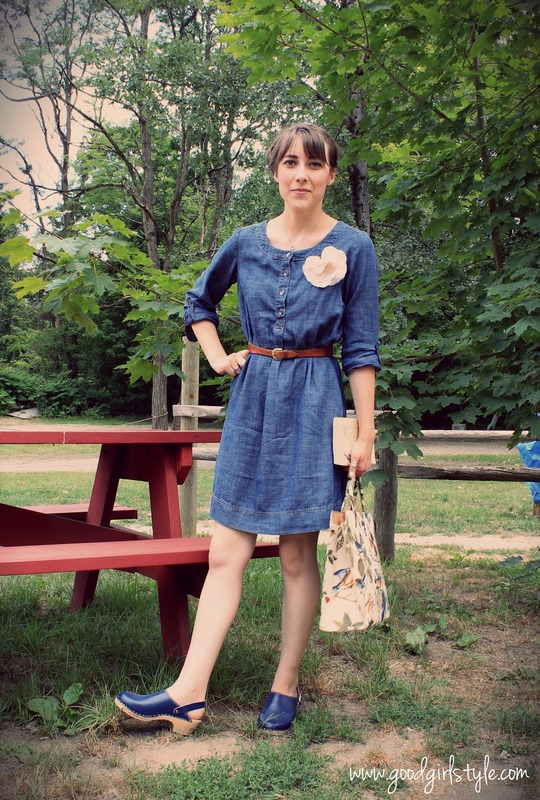 I am in love with my Swedish clogs. I think I've mentioned my Swedish background before, and how anything Swedish delights me. I've wanted some Swedish clogs of my own for my whole life. Now, some twenty-odd years (and $2 at a tag sale) later, I'm enjoying them immensely. I picked up this little chambray J.Jill dress from the same tag sale. The lady had some cute style, right?! 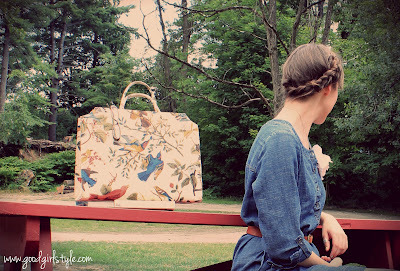 A flower pin, another crown braid and a vintage bag (the colors are much more true-to-life in the above photo). Now, after weekend of tag sales, farmers' markets, and blueberry picking, what's a girl to do? Bake a pie, of course! 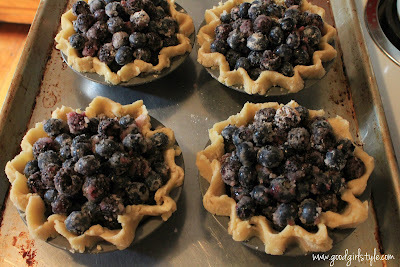 Blueberry-Black Raspberry Gluten Free Mini-Pies to be specific! Mini-Pies have long been one of my 'things.' I adore the making and eating of them. They are just so cute! 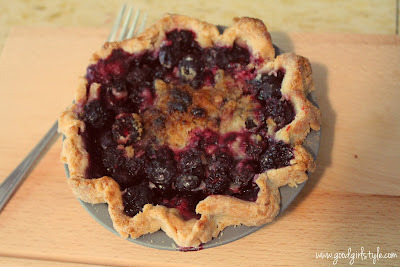 I won a contest way back when with a mini-pie recipe I created (not this one), and ever since, every time I make them I have memories of making dozens (dozens!) of practice pies in the days before the contest. The miniature pie pans can be difficult to find sometimes, but I'm pretty sure I found these at the dollar store of all places. Cut one batch of pie crust dough into 4 pieces. 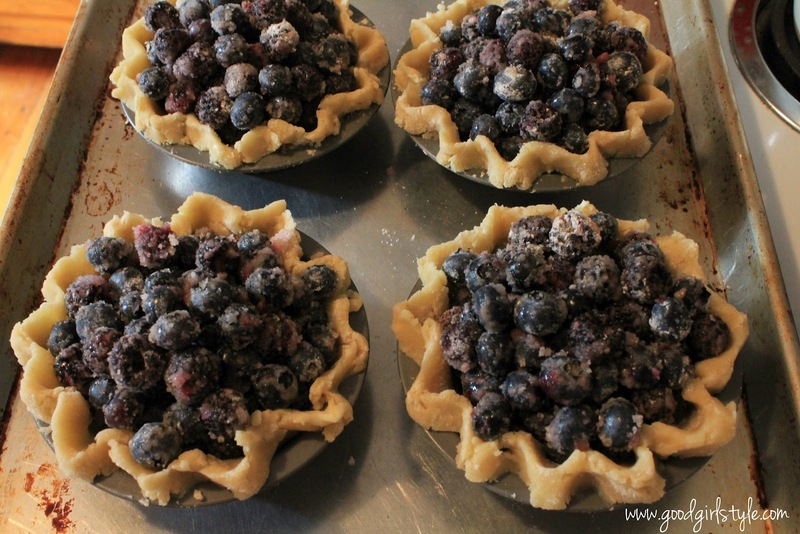 Roll each piece into a small circle, and gently place it into your pie pan. Fold under the edges and flute/crimp as you wish (if you are adding a top crust, just let the extra dough hang over the edge and crimp the top and bottom together later). Repeat for each remaining piece of dough. In a bowl, gently mix the berries, sugar, cornstarch, and spices. Ladle into each pie dish, spreading evenly among the pie dishes. It is a good thing if the berries nearly overflow. Dot small bits of butter on top here and there. At this point you can cut out four circles from a second batch of pie dough for tops if you wish. I highly recommend putting all of the small pies on a large baking sheet for easy transfer to the oven/cleanup. Now bake at 400 degrees for approximately 40 minutes. Check your pies starting at 20 minutes, because depending on your oven, your pie dough, and your pans (mine are nonstick and slightly dark), the small pies may be done earlier. The pies are done when the interior is bubbling and the crust is nice and golden-brown. What guest wouldn't just LOVE a tiny pie all to themselves? Certainly no one *I* know! But who is talking about guests here? Well, I did give ONE mini-pie away. Then I ate the other three.